In our Heview series - reviews for he rather than she - we review products or services made or marketed specifically towards men. This time we are looking at a product by a company called êShave. êShave, as you can tell by the name, is fairly new. Based in New York, it was founded in 1996 as a manufacturer of men's shaving supplies and promotes the art of classic shaving with shaving tips & advice. By classic shaving they mean using a brush to lather up the cream not necessarily classic razors as well, as they only sell modern multi-blade razors - albeit with their own custom handles. êShave states that their brand and website include everything you need for a close and comfortable shave including shaving cream, shaving soap, shaving oil, after shave balm, after shave lotion, artistically designed badger shaving brush and luxury razors. Indeed they have everything you would need to shave, the one thing missing as stated is different razors. If truly promoting 'classic' shaving they would at least have safety razors (as I have switched to) if not straight razors as well. Anyway, this is about the products they do have, and I was impressed from my fist visit to their site. As a proponent of natural, limited ingredients, I was happy to see as I looked at various products that the ingredient list for most is nearly countable on your hands with few of those crazy, undecipherable scientific ingredients among them. 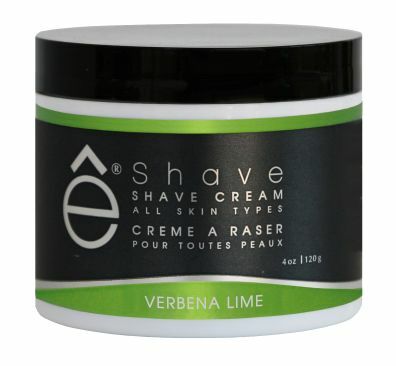 I recently tried their Shave Cream - Verbena Lime scent and was very pleased with the experience - on par with it's having been voted 2010 Men's Health Magazine 'Best Shaving Cream' which means more to me than say a Maxim 'best' product. A four ounce jar goes retail for $22 but per a product tip can last 4-6 months when used with a brush versus applied by hand as less is more. The first thing I look at with products like this is the label. What is in this stuff? Per the web site - all êShave Shave Creams are Paraben Free and contain no SLS, SLES, animal ingredients and synthetic colors. No animal testing and no crazy chemicals sounds great to me. The full ingredient list includes: Purified Water (Aqua), Stearic Acid, Myristic Acid, Potassium Hydroxyde, Coconut Fatty Acid, Glycerin (Glycerine), Natural Oils (quite a few in the Verbana Lime scent), Triethanolamine, Sodium Hydroxide, Limonene, Linalool, Citral. That is twelve total not accounting for the variety of oils used, so a gold star there. Speaking of those oils, essential oils can be used just to scent but also for medicinal purposes and here they are likely used for both. Verbena is hydrating and lime is a strong germicide and astringent to offset the effects of shaving on your skin. The full list of oils includes others formulated just for soothing, invigorating, and rejuvenating the skin. The nice thing is the scent is not overwhelming neither when you use it nor afterward. Onto the cream itself, it falls in a unique variety. Among shaving products there are many consistencies such as gels, creams, and more but the êShave I would call more of a mousse. It has a whipped, airy consistency. My first real test is when I get some product ready - so many dry out my hands usually from alcohol, but this felt moisturizing and did not. I put on my face as directed and used a brush as recommended on half my face to see the difference. I also used a regular disposable razor and my safety razor. To be honest with the type of cream it is I did not find much difference between using a brush or not, and I am a regular brush and soap user so I know what I am doing. It allowed me to use a little less - got more 'lather' for the same amount, but the effect was not much different. Both razor types performed well - extremely well - sliding with little pressure thus creating little if any scraping and damage. The shave was close on both, perhaps the closest and best shave I have gotten with any product with either razor, and if I combined with a pre-shave oil under the cream it could be as close as you can get. Other than closeness of shave, the real test for me is what my skin is like afterward. Here êShave once again performed admirably. My skin irritates easily and there are only a few products and combinations that don't make me feel as if I just finished a battle afterwards. With êShave I had virtually no irritation and my skin felt refreshed and moisturized. The shave also lasted hours longer before that pesky shadow which to me usually is more like 2 or 3 o'clock, but this time well past 5. Overall the êShave cream passed virtually every test with flying colors. The ultimate test - would I buy it again? A resounding yes on this product.